W L Wyllie (1851-1931). Watercolour signed and dated 1916. Provenance: from the collection of Admiral of the Fleet Prince Louis of Battenberg and thence by descent to Lord Ivar Mountbatten. See details below. 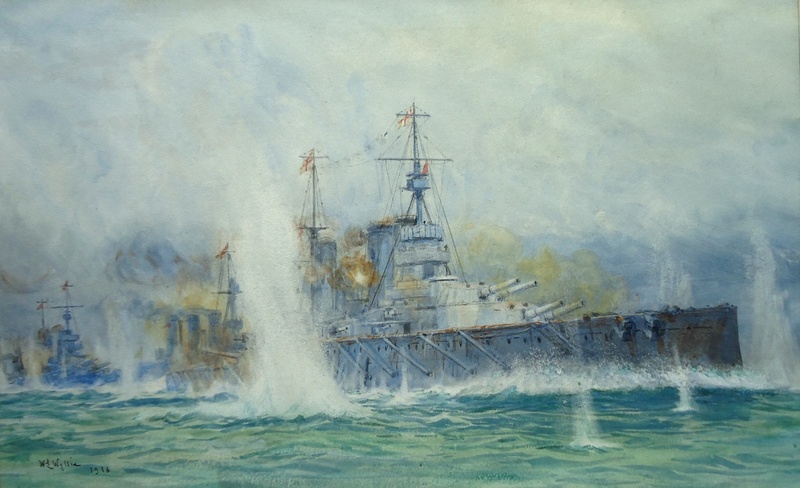 This watercolour appears in Wyllie's Sea Fights of the Great War (facing page 132). It shows LION (Captain A E M Chatfield CVO RN) wearing the flag of A/Vice Admiral Sir David Beatty KCB MVO DSO leading HMS TIGER (Captain H B Pelly MVO RN), HMS PRINCESS ROYAL (Captain Osmond De B Brock RN) and HMS NEW ZEALAND (Captain J F E Green RN) in chase at the Battle of Dogger Bank, a German battle squadron in their sights. This scene would appear to show the situation as, to quote from Wyllie (page 132) "......LION, TIGER, PRINCESS ROYAL and NEW ZEALAND steamed in a line of bearing, the flagship leading, and to the south-east. In this formation each battle cruiser could use all her guns on the port side. INDOMITABLE [Captain Francis Kennedy RN] was farther to the north, together with ARETHUSA and UNDAUNTED, with their destroyers...." "At a little past eleven", Wyllie goes on to say in his book "an unlucky shot, falling steeply, struck LION passing through her decks..." Could this be the moment the artist has painted here, the "shot" showing as a bright flash painted between the for'ard and middle funnel? This was wartime, the censor was fierce and hard factual information was not easy for anyone - even Wyllie with all his naval connections - to come by. The fact that LION was heavily damaged by a succession of German hits was not for general publication and for Wyllie to say, on page 134, "LION took a bad list, but was taken in tow and brought safely to port" was considered prudent for security purposes and quite adequate. The painting together with a further eight WL Wyllie watercolours of World War 1 scenes at sea was originally purchased in 1917/18 by Admiral of the Fleet Lord Louis Mountbatten, 1st Marquess of Milford Haven (1854-1922), formerly styled Prince Louis of Battenberg, and Great Britain's First Sea Lord 1912-1914. It is thought likely that they were bought directly from Mr Wyllie, if not commissioned by the old admiral himself, and they have been in the Mountbatten family ever since. They were recently sold by Lord Ivar Mountbatten.